As healthcare faces digital disruption from new R&D and technology entrants, the big leaders are reconsidering the sector boundaries they previously took for granted and are reaching across sectors to access new markets and new revenue sources. In 2017, we saw a significant surge in healthcare M&A activity, with a 13% increment in mergers and acquisitions when compared to the previous year. 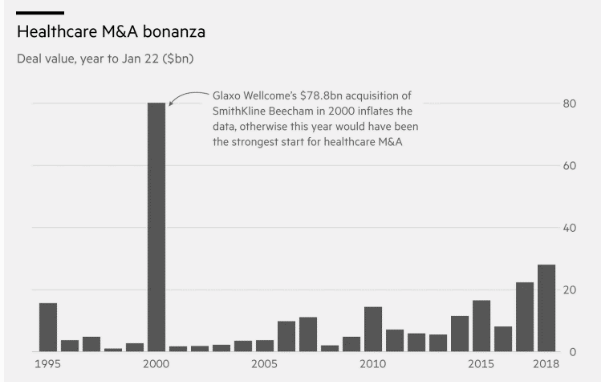 This amounts to the highest number of recorded healthcare merger and acquisition deals in the past decade. Whether it is a provider announcing a new deal or the sale of its facilities, hospitals and health systems significantly contributed to the spike in healthcare merger and acquisition activity in 2018. According to a recent survey of experts, leaders, and forecasters in healthcare 42% of them think that the M&A activity will see a substantial upsurge in the next 5 years. A deep dive into how this activity will play out in specific sectors within healthcare is worthwhile. Here’s the market activity of 2017-2018 in biomedical,pharmaceutical and biotechnology. increased presence from private equities and a greater number of new entrants, while product based companies keenly look forward to capitalize on the wider healthcare tailwinds and leverage their manufacturing expertise. According to GE and Siemens, divestitures will likely continue to be a central piece of M&A activity within the sub-sector. Pharma maintained its leading position with the highest deal volume of any sub-sector for the third time in the last four quarters. 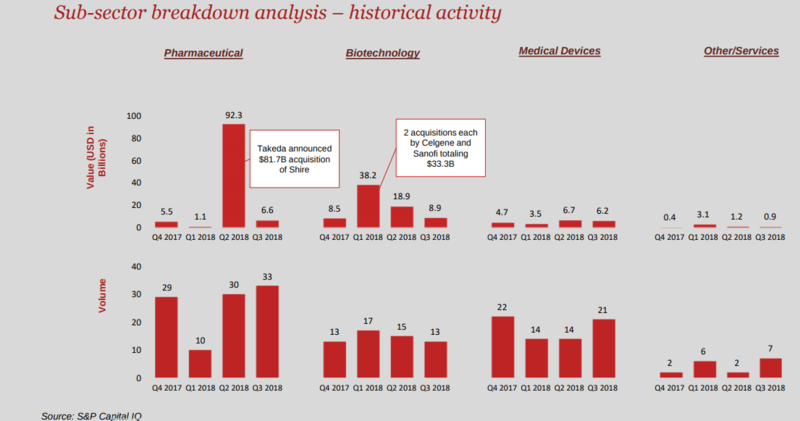 Disinvestments continue to be a focus for Pharma as it is the on quest to strike a rebalance by monetizing certain assets to further invest in their long-term pipeline, either internally or through acquisition. Strategists face conflicts from Private Equity firms that are taking a more active role in bidding for the similar targets. Biotech had the highest deal value of any sub-sector and represented four of the ten largest deals in the quarter. The largest transaction of the period was the acquisition of China Biologic Products Holdings, Inc. by a Chinese investment group for $3.9B. Biotechs continue to evaluate the impact of a changing regulatory environment which may provide longer protection of exclusivity for certain biosimilars within the American market. The impact on digital technologies may propel M&A activity while companies strive to ensure they possess the right competencies to attain profits in an evolving sub-sector. However, what truly contributes to a customer-centric and prolific business is not only an exemplary domain expertise but also the digital disruption blended with your fundamental business functions. As we’ve suggested, while there are many factors driving this M&A activity across the industry, digital technologies are becoming an increasingly important factor, as organizations struggle to acquire expertise in digital technologies and prioritize the need to understand and them effectively. It is important to overhaul the asset from every angle, and bid a goodbye to those conventional M&A due diligence and evaluation models. While evaluating a new acquisition, alliance or joint venture, companies should assess the digital outlook for both the business and the markets in which it operates. Big Data: The most effective way to empower your business after the acquisition phase is to identify value-added improvements is by implementing an enterprise data warehouse. It becomes a one-stop shop for data aggregation as you can access any data across the entire health system. Metadata, security, auditing, and common linkable identifiers are one of the crucial attributes of huge stacks of data. Data Analytics: Focussing on data-driven approaches to valuing the assets utilizing the perfect blend of methodologies is imperative. Harness your large quantity of data to get patient-driven and actionable insights that will enable patient outcomes, alter the way you process data and render a analytical driven culture. Data Security: Data security can be breached in the process of integrating the systems. Cybersecurity ruptures are created due to the distinctions in each organization’s procedures, policies, teams and technologies – the voids that cybercriminals are looking to exploit. In addition, employees unfamiliar with new technology or procedures can lead to system exploitation by cyber frauds. Cloud: Electronic protected health information (ePHI) and other kinds of sensitive data are already scattered across healthcare organizations’ cloud applications and information systems in huge quantities. Merging two organizations increases the volume of confidential data and the footprint of that data dispersed over the network. The newly merged organization needs to know where that confidential data exists. Cloud is one such innovative technology that will bring the scalability and negates the need to worry about hardware and applications. Cloud is the right fit to protect patient data stored in electronic health records, the cloud and big data sets, as required by HIPAA. Technology innovation will enable you to step-up your digital journey and gain competitive edge over other global healthcare players and leaders. Actionable insights and cost optimization are the major pros, as the combined effect of digital innovation and core-domain expertise will facilitate accurate decision-making.